Blacks Canyon Ranch, a working cattle ranch located 290 miles northeast of Sacramento, California, consists of 86,000± acres including 77,000± acres in the Modoc National Forest and the area known as the Devil’s Garden. 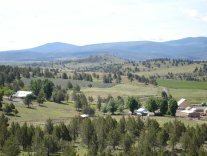 The ranch is located just north of the rural community of Canby, and is 25 miles from Alturas, the County Seat of Modoc County. 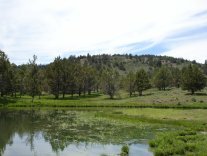 With incredible valley and mountain views, irrigated lands, streams, waterfalls and an abundance of wildlife the ranch offers a very private and secluded piece of the world. 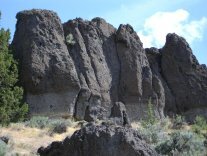 Blacks Canyon starts just north of Canby, cutting north-northwest into the Devil's Garden plateau for some 6 miles of green meadows, creeks, and irrigation ponds. Up the canyon hillsides the meadows give way to bunchgrasses. From there, sage and juniper give way to ponderosa pines and black oak groves that lead up to the spectacular cap rock formations that surround the entire 30-mile canyon rim. ©2006 Tower Investments, LLC All rights Reserved.